What does this mean for MDaemon customers? 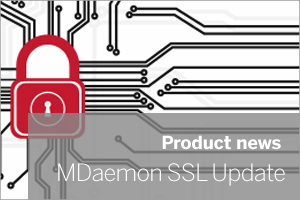 MDaemon uses an encrypted SSL connection to regularly call home to the licencing servers at ALT-N in order to verify the licence details. MDaemon uses the SSL ciphers provided by Windows, so in order to support the latest SHA-2 SSL certificate, you’ll need to be on Server 2008 / Windows 7 or later, as these will include the required support. If you or your customers are using Windows XP or Server 2003 with the latest updates, you should be fine too, however if you’re not automatically updating your O/S, you can download the SSL cipher update patch from Microsoft that will provide you with it. If you want to check that you have the cipher support installed visit this alt-n text page. As always, if you have any MDaemon-related questions feel free to drop us a note in the comments section or get in touch via the usual methods!